STARFIRE can accommodate 12 guests in 6 cabins. The Master cabin has a king size bed, bath/tub, shower and toilet. 2 Guest cabins have a queen size bed, shower and toilet. 2 Guest cabins have a twin bed, a pullman, shower and toilet. A Guest cabin has a king size bed, bath/tub, shower and toilet. STARFIRE is fully air conditioned through out. Crew has a separate companionway, heads and shower. Captain Carl was born in Indianapolis, Indiana in 1974. He has one brother, Ryan, who is a 200 Ton Captain. His father, Ted, is also a Sea Captain; one family, three men of the sea, and over 550,000 nautical miles of combined experience. StarFire’s Captain, spent a portion of his childhood on Water Island in the United States Virgin Islands, alternating with time spent in Indianapolis, Indiana. His recreational life was focused on water sports. He is a competitive water and jet skier, a certified water ski instructor, and a certified rescue scuba diver. Captain Carl's other interests include all types of snow sports and flying helicopters. In 2004, he completed the hours for his private helicopter license — a hobby that gives him as much joy as driving yachts. After graduating from North Central High School in Indianapolis, Indiana, in 1993, he went to work in the yachting industry and became the Captain of a mega yacht at the age of 22. Three mega yachts later, Carl became the Captain of the prestigious M/YStarFire. Captain Carl holds a 1600 Ton United States’ Coast Guard License with a 3000 Ton British License. He is certified in Advanced Radar, Shipboard Fire Fighting, and STCW trained. He also completed a six month Emergency Medical Technician course, which gives him the knowledge to handle a variety of ship health emergencies. His medical expertise expanded with a MedAire Advanced Medical Certification. 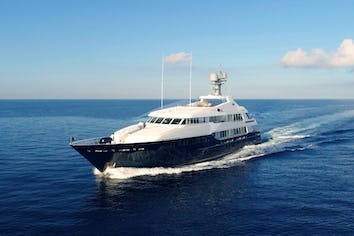 Captain Carl was the individual winner as “Best Captain of a Mega Yacht in 2001” at the Ft. Lauderdale International Boat Show. This accolade was given for his ability to be a “can do” positive leader. StarFire’s Captain takes special pride in imparting his knowledge and love of the sea. In an effort to share his passion with others, he set up “The Captain Carl Sputh Seafaring Scholarship” at his Indianapolis high school alma mater, North Central. Each year, five fortunate students are sponsored to attend a sailing school course aboard the restored A.J. Meerwald Tall Ship in South New Jersey’s Delaware Bay. The scholarship recipients receive full tuition, all travel expenses-paid, $100-a-day spending money — and this year, even foul weather gear donated by the outdoor sportswear company, Patagonia. Captain Carl enjoys the possibility that the experience may introduce some of these students to an entirely new career path they might not otherwise have discovered (in landlocked Indiana, that is!). Captain Carl’s motto for yachting is that “there are no problems…only solutions , ” and he governs himself and his crew accordingly. Richard (Rich) grew up in Pagosa Springs, Colorado, and alas, his position as 1st Officer on M/Y StarFire is not exactly typical of someone who grew up surrounded by snow-peaked mountains and 3 million acres of national forests! An avid snow skier since youth, Rich’s all-around love of the outdoors ultimately led him to the U.S. Merchant Marine Academy in 1993. Rich spent his undergraduate years at the Merchant Marine Academy not only gaining his knowledge of marine engineering and navigation, but also participating as a Varsity member and Fleet Captain of the Offshore Sailing Team. He still enjoys racing sailboats in his leisure time. After logging 130,000 nautical miles in deck and engine cadet positions on unlimited tonnage cargo ships, Rich eventually found his way to the yachting industry in 1995. He has since worked on many high-profile sailing and motor yachts, not only in First Mate and Engineer positions, but also as a Captain. With many impressive marine licenses and certifications under his belt—among them a U.S.C.G. 1600-Ton Inland Master, a U.S.C.G. 100-Ton Upon Oceans Master, and a Cayman Islands 3000-Ton Mate license—Rich’s sailing experiences have taken him all over the world. From South American to Alaska, Egypt to Singapore, and throughout the Caribbean and the Eastern shores of the U.S., Rich has certainly made the most of his career at sea. Mark was born in Bradford, England. He began his yachting career in February 1984 and spent two years “testing the waters” of a career path in yachting by taking on various engineering positions aboard megayachts. With travel being one of his great passions, Mark then took several years to explore various jobs around Europe, including a year handling maintenance in 153 villas on the island of Corfu, Greece. Mark accepted engineering positions doing yacht delivery and refit work—including a sailing yacht refit in Auckland, New Zealand— and spent two busy charter seasons in the Mediterranean before he decided to take an extended holiday to travel Australia by camper van 1n 1993. After this adventure, Mark pursued his Class IV marine engineering certificate in 1994 while he simultaneously took on various relief work engineering positions until his studies were complete. In 2000, Mark began his Y2 Chief Engineering ticket studies and over the next four years he completed this training while remaining steadily busy doing delivery and refit work in such places as Israel, the Adriatic Sea, and the U.S. Mark successfully completed his Y2 Engineering certificate in 2004 and came to take on Starfire’s state-of- the-art engines in summer 2005. M/Y StarFire’s Chief Stewardess and Purser, Mika, was born and raised in South Africa until the age of 19 when she headed off to England to pursue work in the restaurant industry. After a year traveling around Europe in 2000, she “bumped into” the yachting industry in the South of France, and she took a job as a Stewardess aboard a high-profile charter yacht. Believe it or not, that yacht was M/Y StarFire in a past life (when the vessel was known as M/Y Ambrosia, before undergoing refits in 2002 and 2004). This job took Mika to Asia, and she got to experience a crossing from Hong Kong to France via Singapore and the Suez Canal. Mika went on to work on Four other high-profile yachts, both private and charter, and was able to sail extensively throughout the Mediterranean and Caribbean. As a five-year veteran in the industry, Mika says she still can’t get enough of life aboard yachts, and out of all the vessels she’s been employed by, M/Y StarFire has and will always be her favorite boat of all. Mika’s additional training includes Medic First Aid Aboard Ship training, floral arranging, and basic sea survival. She is also a PADI Advanced certified open water diver. Her professionalism and ability to impart her special style of hospitality will make all who enter StarFire’s inner sanctum feel the comforts and warmth of home. Ryan was born in Indianapolis, Indiana. He spent his early childhood on Water Island in the United States Virgin Islands where he began his boating career. His love of water continued on the many lakes and reservoirs of Indiana. Ryan has made numerous motor yacht and sailboat deliveries throughout the Caribbean, crossed the Atlantic three times, and attained his 200 Ton Captain’s license. He is an accomplished knee boarder, a certified scuba diver, and loves to ride his Harley. He is STCW certified with Marine Firefighting endorsements. Ryan began working with his brother Carl on mega yachts when he was 19 years old and continues this tradition on M/Y StarFire. Ryan has placed emphasis on the security aspect of yachts throughout his career. He has taken courses in Maritime Security, Tactical Training, and Anti-terrorism. He extends this security and safety training with MedAire Basic and Advanced Medical certifications. In November of 2001, Ryan helped to bring a mega yacht Crew to the pinnacle of success by being awarded the “Distinguished Crew Service Award.” This award was given for “quick thinking and swift action” taken when an adjacent vessel caught fire. For the ladies who need a dance partner, Ryan is also an expert swing dancer. Apparently, he has the rhythm of the sea in his feet as well as in his soul. Wim relishes in creating culinary masterpieces for the most discerning of palates, using what is available to him locally. His yachting career has allowed him the opportunity to study the local cuisine of many international destinations, including France, Italy, Thailand, India, and the Seychelles. Some of his specialties include French gastronomical cuisine, Asian cuisine, vegetarian and vegan dishes, Japanese cuisine, ice creams, and sorbets. In addition to his wide array of culinary skills, Wim is also a master of many languages: he speaks Dutch, English, French, and conversational German. When not in the galley, Wim can usually be found diving (he is PADI certified), mountain biking, bush trekking, or cooking for his friends! Stephen hails from the Whitsunday Islands in Queensland, Australia . Stephen knew he wanted a career in engineering very early on in life. At the age of only 18, he entered the Moreton Institute of TAFE (a technical institute) in Brisbane where he earned his Certificate III in Electrician Engineering. During his years in school, Stephen also held a four-year apprenticeship as a marine and auto electrician with Benson and Brown Marine Electrics in Airlie Beach, Australia. Stephen’s years pursuing his studies in Australia also left him time to pursue another of his passions: sailing. As an Olympic Sailing Campaigner, Stephen competed in various National Title competitions on the Australian circuit and in the International pre-Olympic series. He also competed in the 1998 Hobbie Cat World Title in Australia. Unfortunately, Australia can only select one team to represent the country in the Olympics, and Stephen fell just short of qualifying with a 2nd place finish one year, and a 3 rd place finish another. From 2000-2002, Stephen worked as the Head Electrician at the Hamilton Island Boatyard in the Great Barrier Reef of Australia where he gained experience servicing and repairing a fleet of charter boats. It was in 2002 when Stephen took his first full-time crew position working as an engineer aboard a heavily chartered motor yacht. He made his way to M/Y Starfire in the summer of 2005. Amy was born and raised in Indianapolis, Indiana. She has had an addictive itch for traveling since she was young and— along with her twin sister, brother and parents— started with the United States. When Amy graduated from high school, she expanded her travels to Europe. During college, she and her sister studied for a summer in Spain and then backpacked across Europe once again. Since then she has had a deepened love for traveling. Upon graduating from Ball State University in 2003 with a degree in Public Relations and a double minor in Travel/Tourism and Spanish, her passion for traveling led her to the yachting industry. Since being in the industry, Amy has been to Croatia, Greece, France and Italy and now the Caribbean. Amy loves meeting new people and going to new places, she hopes to continue doing that while adding more stamps to her passport! Jemma began working in the luxury yachting industry in June 2003, but not before earning a Bachelor’s of Design Degree in Interior Architecture from Christchurch Polytechnic. 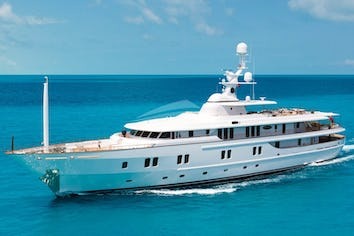 Her experiences prior to yachting also included working as a head dental assistant for four years…But when the Sea finally called, Jemma took a position as a Stewardess on a luxury charter yacht cruising the Med, the Caribbean, and the East Coast U.S., and she has remained in yachting every since. 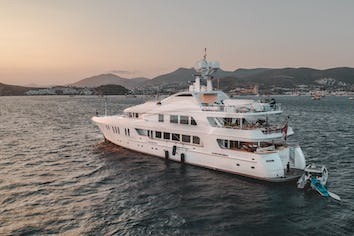 After working on several different high-profile mega yachts, both private and charter, Jemma made her way to her M/Y StarFire home earlier this year. In her spare time, Jemma enjoys travel, sailing, the arts, sports, and cooking. She also recently received her Seafarer Medical Certificate. Photography is another of Jemma’s passions, and she has even taken courses to study the craft.